One thing that was never clearly explained to me when I first came to Washington is how the Capitol Hill ecosystem really works. As complex as a congressional office may seem at first, things are even more tangled than you might think. What happens from the morning to the evening is all intertwined. Consider this: Being a member or a staffer isn't just showing up to work and serving your country every day. Not only do you follow your regularly planned schedule of going to hearings and casting votes, there are hours of phone calls, meetings, constituent tours, cases, meet-and-greets, dinners, constituent walk-ins, photo opportunities, press calls, social media updates, Facebook live opportunities, but still living your own life. Congressional offices have to be on the ball and prepared for everything. Every person you meet, every call you take, every memo you receive are all connected. Fireside works with members-elect and their staff to help prepare for what lies ahead. We know and understand the complex ecosystem of a Congressional office. Why? Because we have lived it. 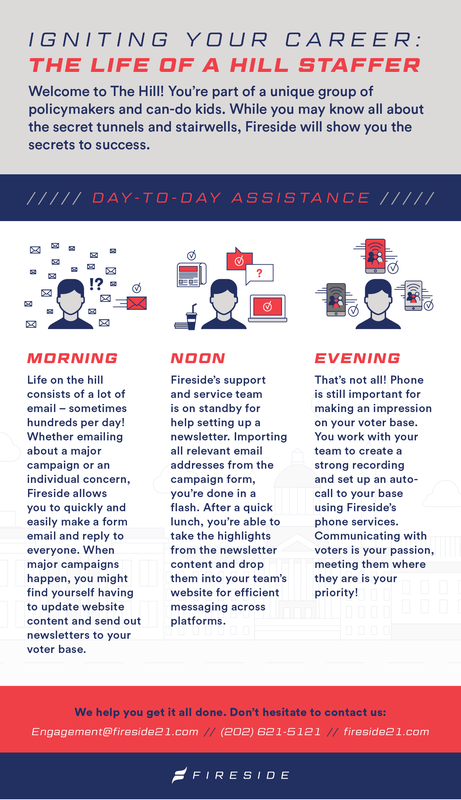 Many staffers at Fireside are a product of the complex place that is Capitol Hill, so we built the tools you need to help manage every moving part. Get ready. It's going be here before you know it!